Guava (or) Koyya in tamil is the fruit with most health benefits, it has four times of vitamin C content compare to Orange. That too the pink Guava fruit is the most beneficial among the Guava fruits. A research done by National Institute of Nutrition - Hyderabad revealed a shocking truth. The researchers selected 14 type of fruits that are generally consumed by Indians and did a research to evaluate the amount of anti-oxidant levels. The list of fruits includes Pomegranate, Custard Apple, Banana, Apple, Mango, Indian Plum, Pine apple, Papaya, Grapes, Watermelonetc., The results showed Guava (or) Koyya as the fruit with highest antioxidants. Antioxidants plays a major role in preventing cellular damage, aging, cancer and severaldegenerative diseases. Guava topped the chart with highest antioxidant content and pine apple ended up last in the chart. Antioxidants ranged as high as 496 milligram per 100 grams in guava and 22 milligram per 100 grams in pineapple. These findings came against the usual belief of costly fruits are the most healthiest fruit. Guava is the most cheapest fruit that we can avail in the market and still it holds the highest nutritional content. To be more specific it is most nutritious food for the kids. The phenolic content in Guava can prevent heart diseases and cancer. Read this article published by Times of India to know more about the research done by National Institute of Nutrition - Hyderabad. 1) Guava is the fruit with highest Vitamin C. This is a necessary content for kids to strenghthen their bones. 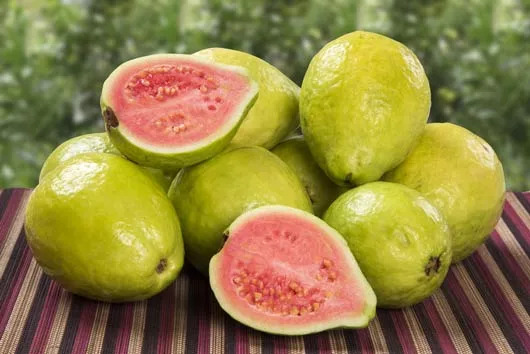 5) Guava can control the Sugar if taken daily. is the highest producer of Guava fruit and a small town Aayakudi near Palani is the home for Guava were it provides major economical contribution. The research revealations again proved that our traditional eateries are always better than any imported consumables.